Don’t let the title of this book fool you, this is not a novelization of the second Star Trek movie. . . although this little volume is tangentially related to that movie. I better start from the beginning. 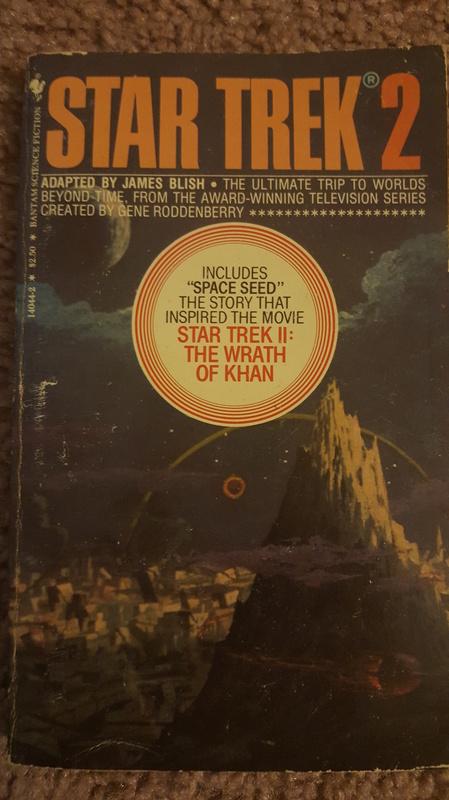 Starting in 1967, James Blish started adapting the Star Trek teleplays into short stories, printed as volumes that covered seven or eight tv episodes. He’d adapt the teleplay before it was edited for television, before it was ever filmed. So the short stories do differ from the tv episode scripts a bit. Also? The short story adaptations skip all the filler junk, you get just the straight up story with none of the stuff needed to fill out a 48 minute tv show. Sometimes that means a tighter story, sometimes it means the story feels very rushed. My favorite thing about these short stories is that they are short. In 13 to 15 pages I get a complete Star Trek adventure. Sure, the long novels are fun and in depth, but these were fun little Star Trek capsules. I should talk about the famous ones first, shouldn’t I?